We hear a lot about Christians “engaging in dialogue” with other groups and religions: Muslims, sodomites, Catholics, etc. But should a Bible-believer do this? What is this “dialogue” everybody wants us to “engage” in? When we take a closer look, what they want is not really dialogue —it’s dialectic, a very old Jesuit principle. Dialectic involves three aspects: thesis, antithesis, and synthesis. These sound complex, but “thesis” and “antithesis” are simply names for two opposites. “Synthesis” is a word for the compromise people reach in order to come to some form of agreement. Here’s the problem: what if the thesis happens to be the truth? If one side is the truth, then the other side —antithesis— has to be a lie. But what is the synthesis? Any compromise between truth and a lie is also a lie. So, actually, if you talk about which side wins, the lie wins out, because a lie is always a lie. It never becomes the truth. Truth compromised is still a lie. But before the eyes of God, everyone loses in this kind of dialogue, or dialectic. What we need is truth, not compromise. We need to persuade the other side to the truth of our side. Then everybody wins and there’s no compromise. The three could have said, “You know, we could just bow our heads down. That’ll be good enough.” But then they would be just as bad as everybody else. They might as well be on their faces in front of the idol. Tilting your head is still compromise. It’s still not what God commanded in His word. Instead, they said, “If it be so, our God whom we serve is able to deliver us from the burning fiery furnace, and he will deliver us out of thine hand, O king. But if not… we will not serve thy gods, nor worship the golden image which thou hast set up” (Daniel 3:17-18). Thesis stayed thesis, and antithesis stayed antithesis. There was no synthesis. In fact, the king in his fury commanded them to heat the fiery furnace seven times hotter, so hot that his mightiest men, who threw them in, died of their burns. But God protected those three. And even if He hadn’t, they just would’ve gone to meet Him. But this time He came to meet them! And when they came out they didn’t even have the smell of fire —or the stink of idolatry on them. They stayed with their thesis. They had no guilt of compromise. For them there was no synthesis. It didn’t matter whether they were afraid or not, because that was not the point. It didn't matter. What mattered was their refusal to compromise. And God completely honored it. This is why dialogue will never work when you have the truth. Dialogue only works with two people who don’t have the truth. One lie synthesized into another lie comes up with a compromise lie. What’s the difference? Examples of the Hegelian Dialectic passed and future. Christianity for the Roman Church(government) is just a mask; hiding her true identity and nature of the Occult. Also remember Rome is a nation and has a seat in the United Nations. What is a (Hegelian) Dialectic? Remember prior to 1776 the colonies were governed by Protestant England and Catholics could not be in government and the Mass could not be said in public. Always keep in mind that England is the only Country that has ever legislated Catholicism illegal. In America it became legal(mass) what was illegal(mass) in England with freedom of religion. England is the only country that has been truly Protestant!!! Thesis: Arm the Muslims and make them hate the Western World and nation-state of Israel. Anti-thesis: Arm the "Christians"(apostate) and "Jews"(apostate) and make them hate the Muslim World. Once the hatred is fomented between these two sides, World War III can be started. When all the fighting is over and the people of the world are exhausted, the Pope of Rome can step in as the good guy and suggest that everybody in the world come together in the name of peace while setting aside our religious differences (ecumenism). The Pope will relocate his throne to Jerusalem. Synthesis: The Pope of Rome will become the leader of the world and we'll end up with a one-world ecumenical/universal religion and a total one-world government and economic system and now we have the "New World Order"
A Quote from Jesuit John Carroll out of "The Ark and the Dove" "The Beginning of Civil and Religious Liberties in America" by J. Moss Ives. It is out of the 6th chapter of the book. Click here to read. "The harmony now subsisting amongst all Christians(prior to 1776 they weren't consider Christians) in this country, so blessed with civil and religious liberty,(prior to 1776 Catholics didn't have civil and religious liberty) which if we have the wisdom and temper to preserve, America may come to exhibit a proof to the world that general and equal toleration, by giving a free circulation to fair argument, is the most effectual method to bring all denominations(thesis:Protestants) of Christians(anti-thesis: Understand Catholics claim to be Christian) to a unity(synthesis: ecumenism) of faith." The above quote from John Carroll is a text book example of the hegelian dialectic. John Carroll had 26 years of Jesuit education. Jesuits are masters at the dialectic and the above is an example of his expertise in using the dialectic. The American revolution produce a Universal government and with the freedom of religion it was the the birth of the ecumenism in America. When we fast forward to 2015 and the visit of a Jesuit pope on September 24, 2015 we see the Hegelian dialectic being played out right before our eyes. The word Catholic means Universal. The pope is going to speak to a Universal government or he is going to speak to a Catholic government. We have 28 Jesuit Universities and 216 Catholic universities. Six out of the Nine chief Justices are Catholic. Now we see who benefited from the eradicating of the penal laws and giving a free hand to Rome. Always remember Rome is a state and has a seat in the U.N. If you have any doubts about Rome's influence in the American revolution, please read chapter V supporting the revolution Click here. Understand it is written by a Catholic Historian. The only history the world hears is the sugar coated history where there is NEVER any mention of the real founding FATHERS. It is real possible dear reader that you might never have heard of Charles Carroll(John, Daniel and Charles) before you came to this web site. Charles Carroll was the wealthiest man in the colonies. Follow the money, Charles Carroll help finance the American revolution. There is a good reason that Charles Carroll is left out of the education of Americans? Why? Because the students and citizens might just put two and two together. Understand they used the dialectic over and over. With the signing of the Declaration of Independents in 1776 America became a universal government, no longer a Protestant government by using the Hegelian Dialectic, combining 99 percent (Protestants-thesis) of the population with 1 per cent(Catholics-anti-thesis) we acquired a Universal government-synthesis. In America it became legal(Mass), what was illegal(Mass) in England and the penal laws become a thing of the past, never to be talked about!! Had this massive penal code been enforced, it could have eradicated English Catholicism and the American revolution turn this all around!! The average citizen in a America does not know the definition of the word Protestant or who the Jesuits serve and do not know Jesuit history. That means that a great percentage of students who attend Jesuit Universities(28 Universities) do not understand the motive or agenda of the Jesuits. Jesuit universities have built a mask around there agenda using education. Students thinking they are getting a education, when in reality they are getting programed to continue the agenda(Mystery Babylon idolatry) of the Jesuits. The founding of American by the Jesuits gave Rome her freewill to practice a superstitious and idolatrous and dissolved the protestant movement in the colonies and England. Understand I used the word dissolve the protestant movement, the population was still 99% protestants and 1% Catholic. American revolution just took the word protest out of the word protestant and gave us a universal government. We always hear they have re-written history. No, they have just left out the history prior to 1776. Here is the key to the mystery: JESUIT HISTORY FROM 1540 TO 1773 IS NOT TAUGHT IN ANY UNIVERSITY IN THE WORLD. If the Americans new their English heritage they might put two and two together and understand what we lost with the American revolution, verses what American got from the revolution. Ignorance is bliss!! Ninety nine per cent of Americans do not know any history prior to 1776. If we did not have the Jesuit American revolution(using Freemasonry has a cover) we would not have 28 Jesuits Universities, 50 Jesuit High Schools, 216 Catholic universities and 6 out of the nine chief Justices are Catholic and NOT one Protestant. It was a brilliant masterful event in history for the Jesuits!! Why? Because the penal laws prior to 1776 would not of allowed them to take complete control through their programing universities. Understand the Protestants had nothing to gain and everything to lose with the American revolution. Now lets ask the question!! Who benefited from the American revolution?? When we fast forward to 2015, history shows us Romes complete control of Education and the government. Understand I am not condemning or trying to discredit Jesuits and Rome. Lets give credit where credit is due. The American revolution was a masterful and brilliant accomplishment of the Jesuits. Simply put, a "dialectic" is an argument ("thesis mask of Christianity") which demands an opposing argument "anti-thesis Occultism"). Through the process of the two conflicting sides, a solution ("synthesis Ecumenical movement ") is reached which represents a compromise of the two seemingly insurmountable opinions. This solution then serves as a new argument ("thesis") and the entire process is repeated. Remember you cannot use truth for a thesis. It only works with a half truth and a half truth is still a lie. Each time the dialectical process is repeated, the compromise serves to shift society away from its original thesis true Christianity -- that is the motive. 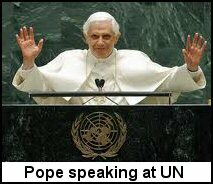 Always remember Catholicism is a government and has a seat in the United Nations. And all the kings got their divine right to rule from the pope, ALL except protestant England. Founding of the American government by combining Protestantism with Catholicism we got a Universal government. Can you name another religion that is a Nation and a government besides Rome?